Leave it to billionaire casino developer Steve Wynn to turn a desolate former Monsanto Chemical Co. site into a lavish billion-dollar gambling resort with a view of the Boston skyline. This week, Las Vegas-based Wynn Resorts released an artist’s rendering of its proposed casino project in the town of Everett, Massachusetts. 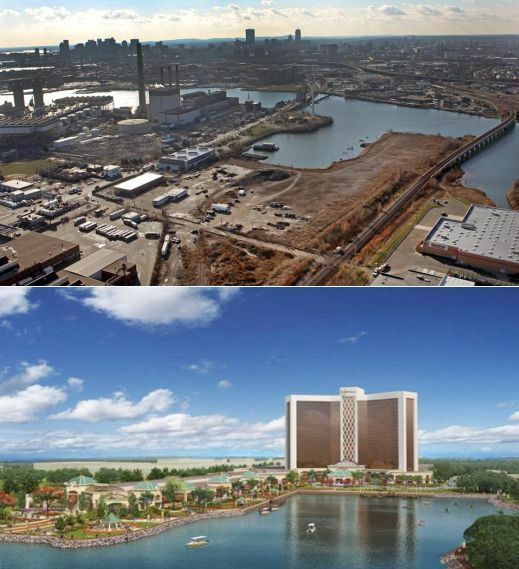 The top image is the site as it currently looks, and below is what it will be transformed into if Wynn Resorts wins the bid for a Boston-area property. According to The Boston Globe, the vacant plot of land, which sits on the Mystic River, is currently polluted. Image via The Globe. A bill in 2011 allowed for three Las Vegas-like casinos to arise from Massachusetts soil. Other firms are in talks elsewhere regarding their respective possibilities. Wynn is also competing to build a casino in Philadelphia.